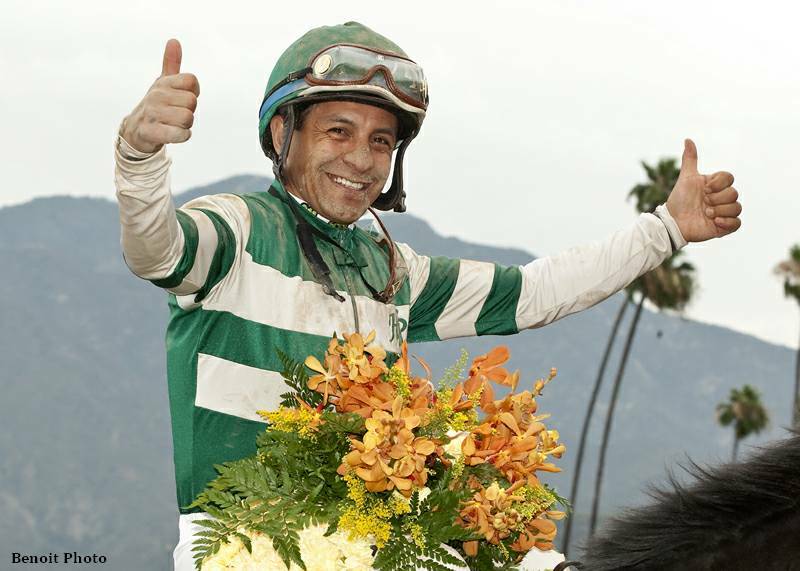 Hall of Fame jockey Victor Espinoza incurred a fracture of the C-3 vertebra in his neck when thrown from his mount Bobby Abu Dhabi, who suffered an apparent fatal heart attack during a workout at approximately 9:05 a.m.Sunday. Espinoza, 46, lay motionless for several minutes before being fitted with a neck brace and being taken by ambulance to Scripps La Jolla Hospital. At 1:15Pacific time, about four hours after the incident, Espinoza's agent, Brian Beach, reported that Espinoza had been diagnosed with a fracture of the C-3 vertebra and a “stinger” to the left shoulder and arm which was causing shoulder pain and numbness which was of concern immediately following the accident. Beach said that Espinoza, who guided American Pharoah to the Triple Crown Championship in 2015, suffered no paralysis or other broken bones. And while he may be sidelined on a “day to day” basis, “It's all good for now. It looks like we dodged a bullet,” Beach said. Espinoza will remain in the hospital overnight. Bobby Abu Dhabi, a 4-year-old son of Macho Uno, owned by Gary Hartunian's Rockingham Ranch and David Bernsen and trained by Peter Miller, was in training for next Saturday's Grade I $300,000 Bing Crosby Stakes. Bobby Abu Dhabi was working in company with stablemate El Huerfano who was scratched from Saturday's San Diego Handicap, when Bobby Abu Dhabi fell between the sixteenth pole and the wire. This entry was posted in NL Article, People and tagged bobby abu dhabi, Del Mar, jockey fall, jockey injury, Macho Uno, Peter Miller, Victor Espinoza by Paulick Report Staff. Bookmark the permalink.